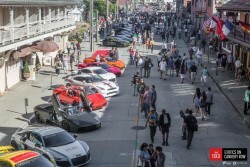 The 10 -16th August 2015 week gathered in the Monterey Bay Peninsula in California the most extravagant collection of cars. The exciting and exquisite world renowned event had a little bit of everything automotive related: racing at Laguna Seca, auctions with legendary cars sold at record prices, the most recently launched modern cars at the Exotics on Cannery Row, vintage collector cars displayed at the Pebble Beach Concours d'Elegance. A very colorful week, with a lot of "musical" engine revving. 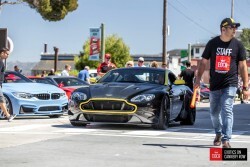 Although there weren't as many Astons on display as we would have liked, we were there to represent the brand and we can't say we didn't enjoy the crowd's attention. 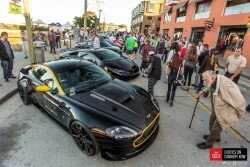 Aston Martin also used this event to introduce some of their newest models to the North American public, including the star car DB10 from the highly anticipated "Spectre" movie, the all-electric crossover DBX Concept, the elegant sports gran tourer DB9 GT and the Lagonda Taraf, a super sedan that is still made just for Europe and Middle East. 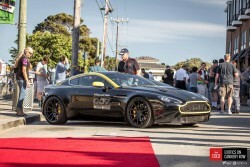 The CEO Andy Palmer and Design Director Marek Reichman were there to answer any questions about all the cars that were present at the Aston Martin estate.